There is a vibrant world waiting to be discovered across Romania, outside capital city Bucharest and much of it rests unknown. Some of Romania's biggest cities have a rich history, have witnessed the creation of the country's culture and some of them are currently flourishing business hubs. Romania-insider.com starts a series of articles presenting major Romania cities. This week's pick is Timisoara, the first mainland European city to to be lit by electric street lamps in 1884. This was also the city where the anti-communist revolution spark started in 1989. 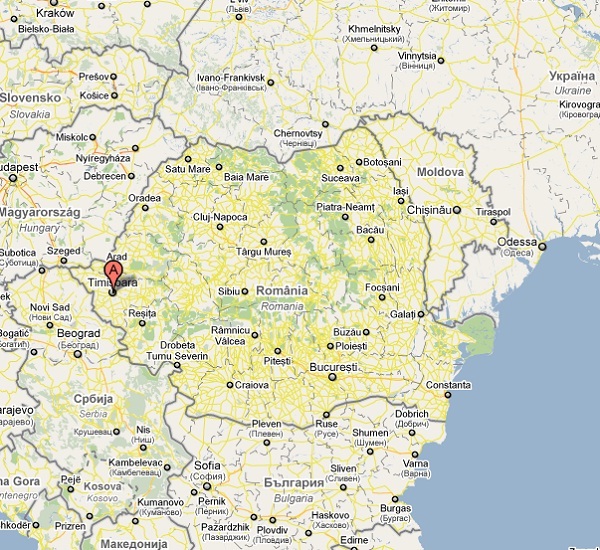 Locate at the crossroad of the most important trade routes which connected the Orient to the Occident, Timisoara- Temeswar or Temeschburg in German and Temesvár in Hungarian- one of Romania’s most western points on the map, is the biggest city in the Timis County, with 400.000 inhabitants. Located in the Banat area, the city took its name from the river Timis that was called by the Romans Tibisis or Tibiscus. Timisoara was first mentioned in 1266 under the name of Castrus Timisiensis, a territory which was later to be known as Banat. The area was conquered and included in the Kingdom of Hungary in 1030. The city bloomed under the reign of Charles I who loved the place and ordered the construction of a royal palace in Timisoara. The city was also important from a military point of view thanks to its strategic location, which facilitated the control over the entire Banat plain. However, Timisoara stood under Ottoman rule as a capital for nearly 160 years after it was conquered in 1552 by Ahmed Pasha with 160,000 Ottoman forces which defeated the resisting 2,300 men and beheaded the local military commander Stefan Losonczy. During the Ottoman rule, the city underwent a process of Islamization, enjoying a special status, similar to other cities in the region such as Budapest and Belgrade. went through major changes as numerous factories have been built, electric illumination and public transportation have been introduced on several major road arteries that were built to connect the suburbs with the city centre. It was the first mainland European city to be lit by electric street lamps in 1884. Timisoara, with its long and interesting history, suffered damages during the World War II from both parties' bombing raids, changing from being a member of Axis to joining Allies and declaring war to Nazi Germany. Later, Timisoara has witnessed another great event in the entire country’s history, a series of mass street protests in what was to become the beginning of the Romanian Revolution in 1989. Nowadays, Timisoara is an important economic centre, owing some of the development to its past under the Habsburg administration. Timisoara has been targeted by foreign investors, being the first city in the country with international routes and with the first navigable canal Bega, with great opening not only to Europe but also to the rest of the world, leading the local trade development. The city has been chosen by several companies, like Continental AG, which produces tires since 2000 in Timisoara, the Linde Group, Dräxlmaier Group. The Timis county itself also attracted investors like Swiss company FM Logistic, producers like Nestlé, Procter&Gamble, Arctic, Danone, Contitech, Flextronics and Smithfield Foods. Timisoara features a well developed public transport network consisting of trams, trolleybuses and buses for both metropolitan and express lines. The city has Romania’s third busiest airport, Traian Vuia International Airport, which is the host of Romania's second-largest airline, Carpatair. Talking about its cityscape, Timisoara’s tallest buildings will be completed by 2012, The Tender Financial Center, with a height of 180 meters and Timisoara High Tower, with a height of 138 meters. Currently Timisoara has the Fructus Tower as the highest construction , 65 meters tall. Besides all these modern sites, the city holds constructions from the Austro-Hungarian period and historic areas such as Cetate - Belváros in Hungarian and Innere Stadt in German, Iosefin – Józsefváros or Josephstadt, Elisabetin - Erzsébetváros, Elisabethstadt and Fabric - Gyárváros, Fabrikstadt. Timisoara’s Orthodox Cathedral, Saint George’s Dome, Millenium Church and the Huniade Castle are some of the must-see landmarks in the city. Besides all these, numerous bars, café lounges, clubs and restaurants are opened in the old Baroque style in Unirii Square. 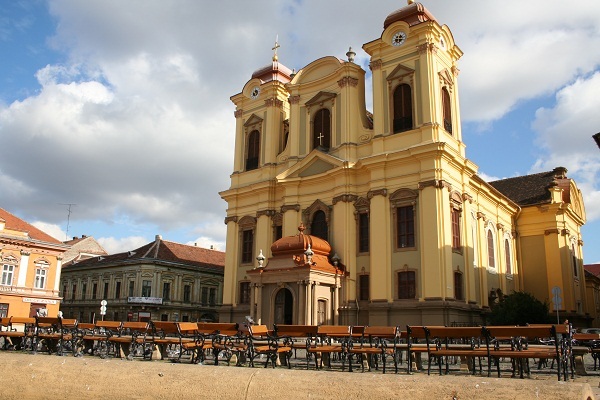 Timisoara is also known as the Garden city, due to its many public parks, gardens and green areas and has a great cultural scene shaped by three big theatres: Romanian, German and Hungarian, with Romanian Opera House and other halls for artistic events. 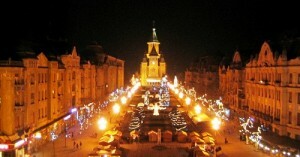 In terms of living standards, Timişoara ranks fourth nationwide, being named “Romania's economic showcase” by the French magazine L'Expansion in 2005. On a more consumer-oriented note, the city hosts two shopping malls: Bega Shopping Center, Iulius Mall Timisoara and several international retailers: Carrefour, Real, Kaufland, Metro Cash & Carry, Auchan, among others.